Last night, I had Taiwanese food for dinner with a few friends. We ordered an oyster omelette (also called oyster pancake in some restaurants) as one of our appetizers. Oyster omelette – egg, oysters, mushrooms, green onion, and some leafy greens. Oyster omelet was invented in early times when food was scarce and people learned to be creative with alternative forms of food. It may be described as a dish originating from a poor society. Oyster omelet is made with fresh oysters, a batter of potato and sweet potato starch, eggs and green leafy vegetables—all pan-fried over high heat. Before serving, a specially concocted sweet-and-sour sauce is poured on top for added flavor. This delectable dish is a common sight in night markets across Taiwan. 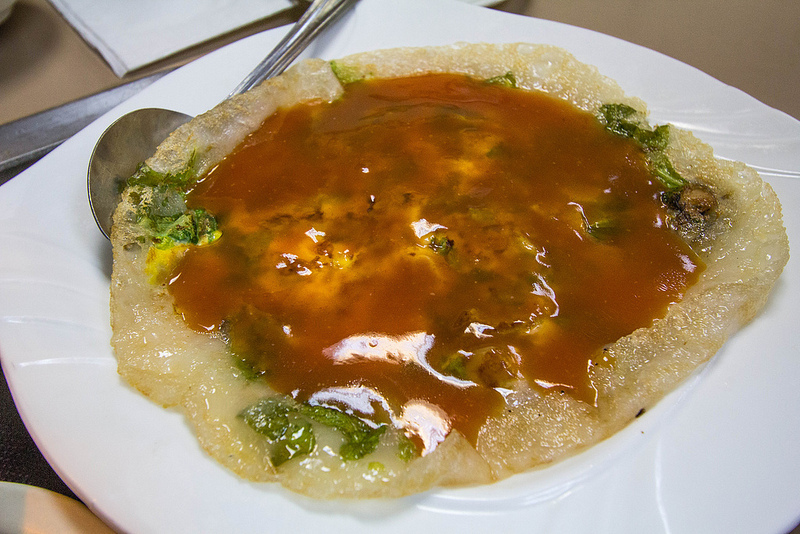 The earliest form of oyster omelet is a traditional snack well known among the older generation in Tainan’s Anping area. Round and flat in shape, it consisted of oysters, pork and/or mushroom, wrapped and pan-fried in sweet potato starch. Legend has it that in the 17th century when the Dutch took control of Anping, Zheng Cheng-gong (Koxinga) and his army fought and took the land. Defeated, the Dutch army hid all food provisions in a fit of anger, leaving Zheng’s troops to scrounge from local environs. They consequently used Tainan’s specialty oysters, mixed it with sweet potato starch and fried it into a dough-wrapped patty. The recipe was passed down through generations and has now become a popular snack in Taiwan.